In high school, Rachel Maddow was a long-haired blonde, complete with Birkenstocks and an SAT prep book vocabulary. Today, as a well-paid journalist hawking a franchise that has convinced far too many Americans that liberal means unquestioned allegiance to the Democrat in the White House, Maddow has crafted an entirely different image, complete with an entirely different uniform. Either one of these versions is an impostor or Rachel Maddow has no scruples about playing whatever role the mainstream expects of her. She has never been and is not a radical, a free-thinker or even, hold your breath, a progressive. "Progressive" implies being ahead of one's time, having the intelligence and knowledge to see beyond the trees to a point that most people cannot view, let alone imagine. And the key here is knowledge: the world is full of brains but so few of them have been inside a library. So it goes with Maddow, whose perfunctory peddling of Washington propaganda as fact has earned her millions and a platform to sustain the status quo. The sorry truth is that if Maddow actually offered anything that hasn't been openly addressed in a congressional hearing, she wouldn't be where she is. In a segment about US federal holidays versus federal holidays in "dictatorships" on her April 11th show, Maddow began by pointing out that Americans will only get 10 federal holidays in 2013 -- not one of which is a federally-mandated paid day off. It's a low count by global estimates, considering workers throughout Europe and Asia get what amounts to months of paid vacation time annually, unlike in the US where a five-year employment stint will elevate an employee to the amount of vacation time many other nations consider the bare minimum: 2-3 weeks, and even then, it's not usually paid time off. Not a good start, Maddow -- the status quo maintains that you proudly wave the flag of patriotism and point out that the American worker (an individual who often needs two jobs just to make ends meet) is so diligent that s/he doesn't need any more than 10 federally mandated days in which to fend off competing co-workers for the late shift on a holiday. Having, despite herself, grumbled about low holiday time in America, she then proceeds to make America look even worse by pointing out that the Islamic Republic of Iran -- America's, and therefore her, archnemesis -- has 28 national holidays because "dictatorships" (not to be confused with dicpotatoships which are hand cut and use Hawaiian sea salt instead of Mortons iodized) force their people to take time off. "According to the dictators who run dictatorships," she said in a tone that can best be described as the arrogance of presumed authority, "there are lots of reasons to stop and reflect and celebrate whatever it is the dictator is telling us to celebrate." Except, oops. She places the beginning of the Iranian dictatorship at 1979, with the return to Iran of Ayatollah Khomeini and the formation of the Islamic Republic, unknowingly omitting the unfortunate debacle we'll simply refer to here as "the monarchy," which was led by "the monarch" whose autocratic failures are too numerous to detail here. And, double oops. 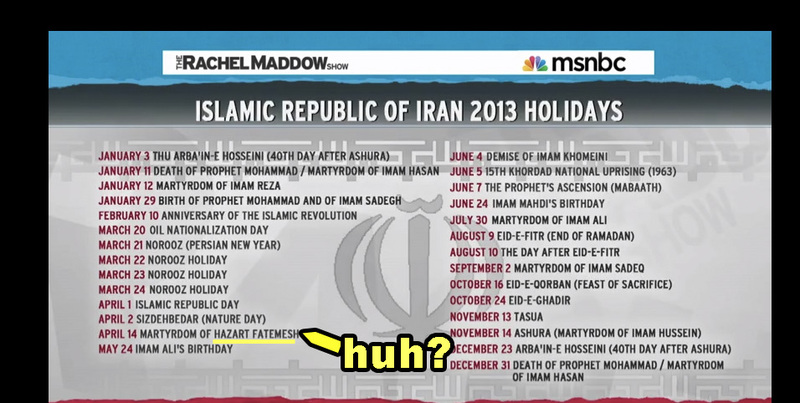 The dictator Ayatollahs didn't tell Iranians to celebrate Nowruz, as Maddow has listed on her graphic -- quite the opposite, they tried to ban it, calling it un-Islamic and blasphemous. The fact that it's on Maddow's list in 2013 is a testament to the Iranian people who continued and continue to celebrate this ancient holiday as part of their cultural tradition no matter who or what is in power. And, triple oops. By pointing out that a dictatorship (mind you, one in which -- amongst other horrible things -- women get paid maternity leave, unlike in America) has more time off for workers than the world's greatest democracy, Maddow has unwittingly criticized the very system she spends her broadcasting hours extolling. And all of this is quite rich when one considers the gamut of American holidays which includes Columbus Day, a celebration of nothing short of ethnic cleansing and genocide, and Veterans Day, one day out of the year that the federal government feigns interest in the decayed or decaying lives of the young men and women it sent off to fight corporate wars for companies and weasels who could care less about human sacrifice. And don't forget Labor Day, a celebration of the de facto neutering of this nation's unions. As a final nail in the coffin of her ignorance (either that or her shortage of qualified interns), the graphic which Maddow used for the segment included a number of typos, not least was a curious reference to an April 14 Iranian holiday called "Martyrdom of Hazart Fatemesh," an unfortunate reference to what Iranians refer to as the martyrdom of Hazrat Fatemeh or Fatimah, the daughter of the Prophet (hazrat being an honorific title), an individual who is highly revered throughout the Muslim world but who Maddow and her team saw fit to mock. The sheer prejudice and outright Saidian orientalism that Maddow exhibited in this 4-minute segment is eerily reminiscent of the Jim Crow days of American broadcasting when "respectable" journalists and entertainers could get away with insulting an entire race of people, their traditions and their beliefs, without batting an eye. In this case, Maddow has not only insulted Iranians but every Muslim in the world, too. Just imagine the uproar if she took such liberties with any other of the world's major religions. To top it off, Maddow claims to be a different and more open-minded alternative to the George W. Bush America, but her repeated references to "us" and "them" in this brief segment proved that, like the ancient Persian religion of Manichaeism, she only sees things in black and white -- not unlike her idols in Washington. That's right Maddow, "us" does not include the millions of Muslim Americans who celebrate some of these holidays and the millions of Iranian Americans who celebrate Nowruz -- that's all "them," those beardie weirdies across the way who don't look human and certainly don't act it. Carry on, madame. Carry on. And while you're at it, please tell us why an Eid holiday celebrated by over a billion people is more ridiculous than the two days the British people were given off last year because the Queen managed to rob the public of its coffers for a whopping 50 years and counting.